Winnipeg is a city located on the Canadian prairie, and winter can last over half the year. The Assiniboine and Red Rivers meet in the center of the city, and in the winter the plows emerge and many skating trails are created for pleasure, sport and commuting. With extremely cold temperatures and affiliated winds, warming hut shelters along the trails enhances one’s ability to pause and tighten one’s skates, for instance. 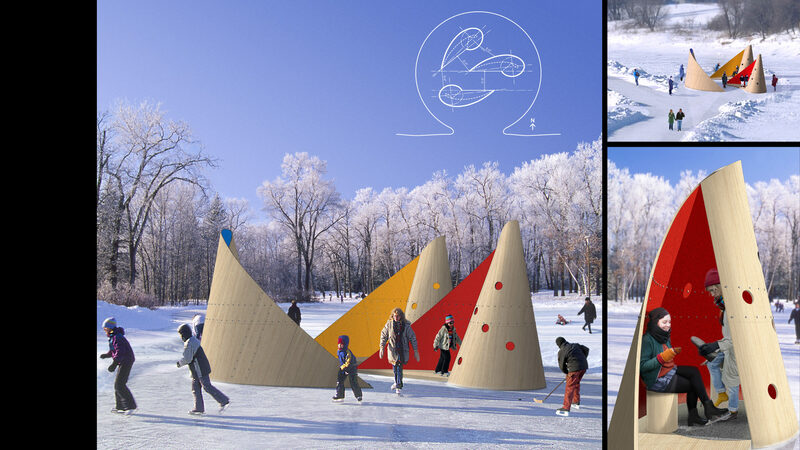 This international design competition was for the design and construction of temporary shelters located along one of the skating trails. Our proposal is entitled, “Red, Yellow, Blue,” and is composed of an ensemble of three temporary structures. 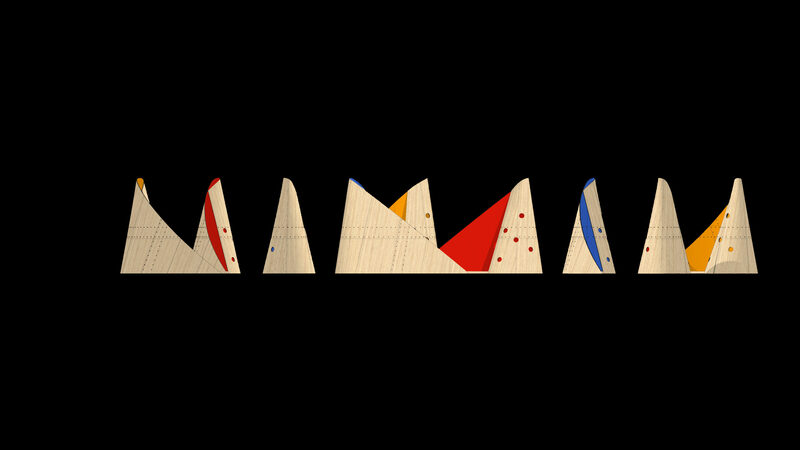 Red, Yellow, Blue is a colorful composition of three tilted cones that take inspiration from universal forms found in nature (oval, spiral, cone), and the work of the lyiniwok female architects who built ephemeral travelling lodges. 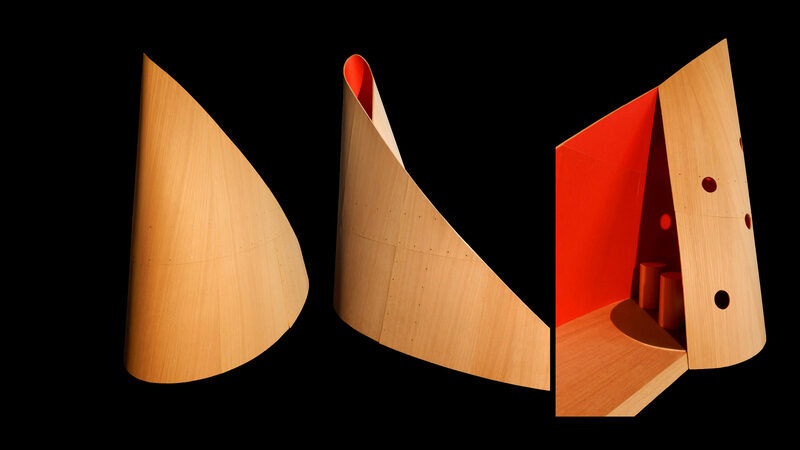 The ensemble is composed of an intimate grouping of three identical structures made of bendable plywood with three layers of cross-lamination. 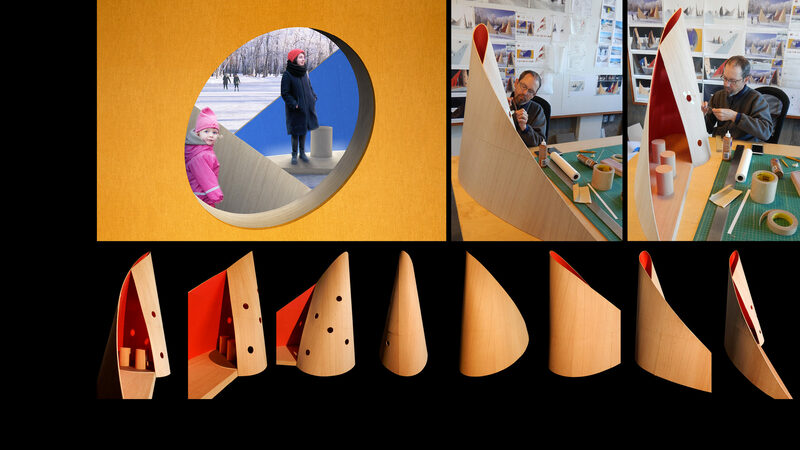 Experiments in our studio’s workshop with a quarter scale prototype formed the basis of the final structure. The body of each replicates the layered tectonics of self-supporting forms found in nature and playfully reinterprets the indigenous macekin with an egg-shaped plan and an interior lined with 100 % wool felt of vibrant, tactile primary colors. A curved arm of color extends outward to invite passersby within. Once inside, the space feels like a warm blanket wrapped around you. Movable seats invite people to cozy or simply rest. Sunlight dances across the interior from above. Circular peek-a-boo portholes provide a delightful surprise, and a warm glow of light transmits into the nighttime landscape.